This is the public profile of Alice Le Biez, Additional information and high-resolution images are available for accredited press members, to access additional information about Alice Le Biez please login as a press member. 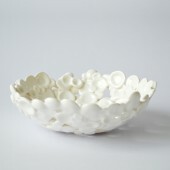 Alice Le Biez explores the link between crafts and design, traditional skills and new technologies. She believes that traditional skills can allow the designer to explore new fields of creation by using new technologies such as 3D printers. A 3D printer is mostly use to create complex shapes but can also be used to create stories, emotional design such as traditional crafts. With 3D printing, when you have the same design but using different materials, at the end your product will look totally different and will tell a different story. When we are talking about 3D printing, the first thing many people think is complex objects but also more disposable products. They don’t give value to this. With this work I intended to show that 3D printers can bring a lot to designers and craftsmens. As a craftsman-designer, if I had to make it, I would have spend money in the porcelain, plaster if I had to make a bowl, make a lot of samples because you never sure what can happen. I would consider the size because when you fired it, it shrinks. And the most important it would take me time - almost a month. With the 3D printer, I save time and money. I also didn’t have to care about the size, I directly made my model at the good dimensions, it doesn’t shrink at the impression. In my opinion, 3D printers are a great tool which allow designers but also craftsmen to go further in their work, a craftsmen will add his passion, his savoir-faire and his knowlegde of the material to go further and develop new products. A designer will create more complex shapes by using his software. 3D printers give a new perspective on designing to both designers and craftsmen and offer a whole new field of creation. Press Members: Request an exclusive interview with Alice Le Biez.